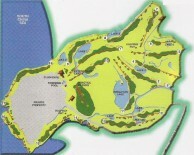 The Damai Golf and Country Club in Sarawak opened in 1996 and featured the first Arnold Palmer designed course in Malaysia. 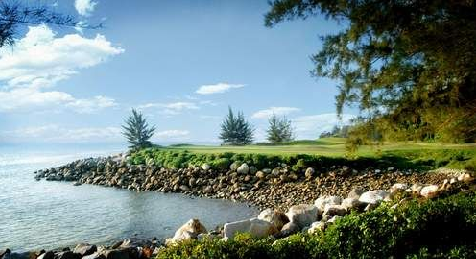 The golf course borders the foothills of Mount Santubong and plays along the beaches, rocky outcrops and mangrove forests on a peninsula protruding into the South China Sea. 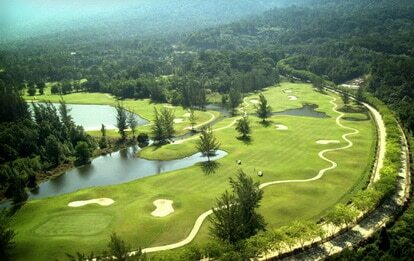 Damai Golf and Country Club has hosted major golf events such as the Damai Challenge, World Golf Amateur Challenge and Carlsberg Golf Classic. Damai consists of the Mountain Nine and the Ocean Nine which are remarkably different. The front Mountain Nine offers challenging golf in a rugged, natural rainforest setting. It follows the contours of mountain foothills. The back Ocean Nine hugs the South China Sea and features scenic fairways and beautiful beaches with the coastal ranges in the distance. Greens are generally small and favor accurate approach shots. A few of the best holes include the 3rd, a short 147 yard par-3 that plays to an elevated green. Two deep bunkers in front, right & left of the green and a stream running on the right wait for errant shots. The 8th is the longest par-5 on the course. The 556-yard dogleg right has a wide landing area for the tee shot, but the fairway narrows as it reaches the green. A lake guards the left side of the fairway and comes into play on the second shot. 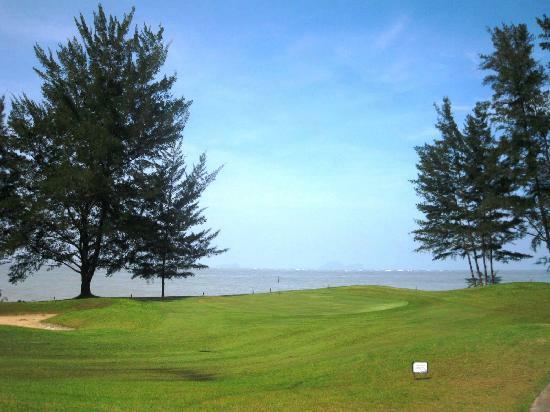 This hole was chosen the third most challenging hole in Malaysia by the Golf Malaysia readers’ polls of the year of 2004. The par-4 15th is a beautiful 335-yard hole with mangrove swamps and the ocean on the left and OB on the right. Three bunkers on right & left of the narrow fairway come into play off the tee, and longer drives face a tight landing area squeezed by the ocean on the left and trees on the right. The signature 17th is a 168 yard par-3. It plays slightly downhill, and the South China Sea covers three sides of the green. The club selection is critical as the prevailing winds come into play daily. The closing par-5 is a sharp dogleg to the right. The entire left side guarded by the ocean and the right area by trees adds to the obstacles. Moreover, tight landing areas make precise shot-making a must to have a chance for par. With mountains in the backdrop and beaches and ocean on the sides. 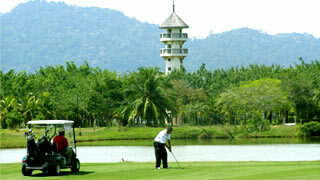 The Damai Golf and Country Club offers facilities such as a grass driving range, practice areas, golfer’s cafe, pro shop, and locker rooms. The clubhouse is a bit dated, but still adequate for most Sawarak golfers needs. Have you played golf at the Damai Golf & Country Club and took some nice photos that you would like to share with other golfers? Send them to us and we may upload them here. Thank you in advance!